Getting a 10' X 20' Enclosed Canopy with Plastic Windows is the quickest, easiest, and most affordable way to handle an immediate need for a high-quality structure. This portable garage canopy isn't called the Hercules for nothing. It's called the Hercules because it's sturdy, it looks great, and customers everywhere swear by its performance. That performance comes largely from the quality of the construction. The eight leg supports are made of 20 gauge, powder-coated steel to provide a stable foundation. 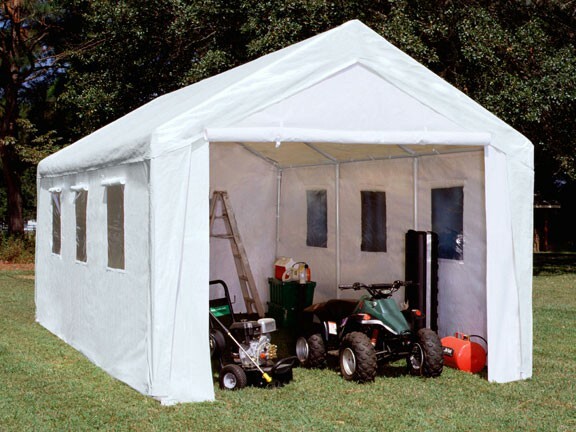 The polyethylene canopy cover is perfect for protecting vehicles, equipment, or anything else that requires a quick, reliable storage solution. Weight: 195 Lbs. Box 1: 77 Lbs. Box 2: 98 Lbs.